Memphis trio Diry Streets have just released their new album White Horse. 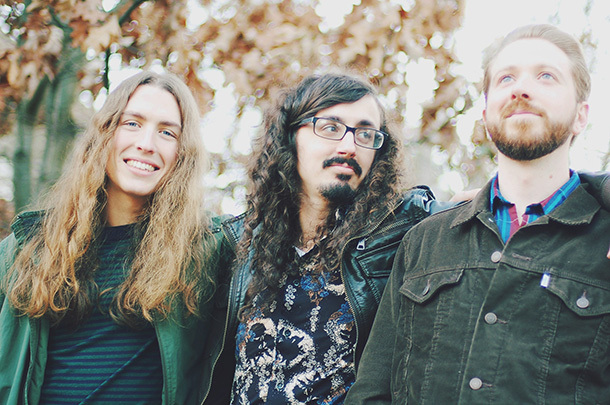 Blues Rock Review caught up with frontman Justin Toland to talk about the album and more. “White Horse” is the title track. What inspired the track and how to did you decide that for that album name? The song was kind of inspired by just trying to write about a feeling more than anything. It’s really abstract in that way. As it usually goes, I had the lines bouncing around in my head all day. There was a feeling that behind all my struggle there was always this peace, sort of an inner salvation that comes from playing music and expressing myself. I couldn’t really put my finger on what to call this feeling of freedom that overcomes me when I am inspired to write or in the process of playing music, but the vision of the white horse kept coming to mind. It just made sense to me, the wild and untamed myth that your chasing down when you search for that specific beat, riff or melody to fill the space that turns into a song. That feeling really became sort of the guide post for the whole album. It was more about following that invisible something more than trying control it. It was letting the songs write themselves. Once I told Thomas about possibly naming the album after the song, he said that was it. It stuck right away because it really captured the feel of writing the record. “Dust” is a bit of a different track for the band. What’s the story behind that? That song just flowed out in a stream of consciousness kind of way. I sat down on the guitar in my room and started playing. The melody, the feel and the lyrics were all just what I was feeling in the moment. I was in a sort of meditative state really contemplating my existence. The funny thing is that I just wrote it with the desire to get it out more than to use as a Dirty Streets song. I didn’t show it to anyone for a few months. One time I was fast forwarding through some demos on our four track cassette recorder, and Andrew heard a few seconds while I was trying to find another track and said “what is that?” I went back and showed him and he wanted to work on it. We quickly put down a version with drums and guitar live in the practice space. I forgot about it again, then Thomas heard that version while I was browsing again, and once again said “Lets work on that.” So eventually it ended up getting the band treatment and got put on the record. Were any of the songs on the album a challenge to put together? Most of the album was so natural and enjoyable that I can’t really say it was a challenge, but the title track, “White Horse” was a long process. The music itself was initially a bunch of parts that we couldn’t really place anywhere. It then developed into a completely different song than what ended up on the album. We just kept saying “It’s just not there yet.” After coming back to it and re-writing it completely over the course of a few months, it ended up being a pretty expressive track. Once the music was down, I penned the lyrics really quickly. That part was pretty effortless due to the fact that song unfolded with a struggle followed by blissful satisfaction and that’s what the song ended up being about too. Was there a particular goal for the album? One of the main goals we had early on for this record was that every person in the band was going to really dig every part or we were going to write something better. With that in mind, we were constantly pushing to find that perfect spot for everything. For everything we have written and recorded as a band, groove has been one of the main focuses. This time we tested the groove on everything in a way by getting in there with some simple percussion and seeing if we could feel it. If playing the egg shaker or tambourine made you want to move your whole body, then the tempo and groove was in the place it needed to be. The band has done more touring recently. What differences are there between the record and the live show? For us, the record and the live show are really closely related because we always record live in the studio as much as possible with minimum overdubs. You can really only capture the feel of a song or the vibe of the whole thing when you are cutting it live. In the studio though, the only energy you have to vibe off of is each other. Live sometimes you can feed of the energy of the crowd and get something completely unique going on. The other thing that sets the record apart from a live show is just the small things you get to add for texture. There is that opportunity in the studio to create the entire world in which you are birthing the song into. You can move instruments around in the room to get more distance or move them closer to get a beefiness. You can paint more of a specific picture than you can live. There are more colors to work with in the studio. The band has a few more gigs lined up in December, anymore touring in the works? We have some more US tours in the works and our first European tour is coming up in the spring so we are looking forward to that. All dates will be posted soon.